The EasyControl pH electrodes are simple entry level electrodes for process applications such as water treatment. The robust sensor design with a diaphragm and a gel electrolyte allow long lifetimes in surface and drinking water applications. The InchTrode family of process pH electrodes is designed for the use in wastewater applications due to its resistant plastic housing. An additional housing for the process connection is not needed because the plastic shaft has an NPT thread. The Liq-Glass PG process pH electrode is an entry level sensor for chemical or waste water applications and low process temperatures. ( from -5 °C up to +60 °C). Suitable for samples with low conductivity. 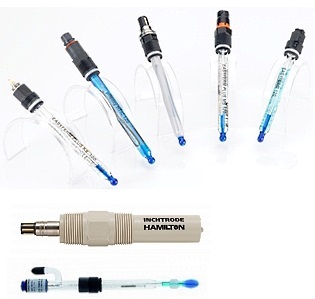 Rose Scientific is the source for the whole range of Hamilton electrodes, including Process pH Electrodes in the EasyFerm, Chemotrode, pHeasy, Polilyte and Polyclave series, as well as Lab pH sensors in the Liq-Glass, Single Pore Glass, Polilyte Lab, Flushtrode, Slimtrode, Filtrode and Gel-Glass series. Special use series Biotrode, Minitrode, Spintrode and Flatrode are available as well as sensors for food applications such as the Foodtrode, Tiptrode, and Double Pore series. Portable sensors such as the Polyplast and Double Pore Knick DIN. The whole range of Hamilton Arc sensors and accessories are also available. Call for more information.